This is an example of one of my story covers for my upcoming audio book. This has been one of more challenging times in my life. My eye still bothers me and I have tremendous stress, which I cannot share. To cope, I surround myself with music. My musical elixir continues to soothe my soul and inspire me. I cannot imagine what I would do without it. A few days ago, a new melody for a song began to play in my life. I am not sure at all what lyrics I’ll write, but I’m patient as I wait for inspiration. Currently, I am celebrating that I suddenly have found a new and stronger voice. My vocal improvement is skyrocketing into the heavens as a result of working with Kimberly Haynes. I have a tendency to talk a lot during my voice lessons. It’s because I become so excited by the opportunity to share my passion for music. In order to learn from Kimberly, I try really hard to concentrate. She is gentle, yet firm as she redirects me. Kimberly is such a wonderful teacher. She is thoughtful as she demonstrates vocalizing, carefully explaining every detail in order to help me achieve the best vocal result. Her steady encouragement and positive approach shines. Once again, I’ve found laughter in my life. During the time we’re together, I work myself to exhaustion, but soar with joy hearing the results. Every week at our lesson, I share songs I’m going to work on with Kimberly. Her input has made a significant difference. My music heals me in so many ways. 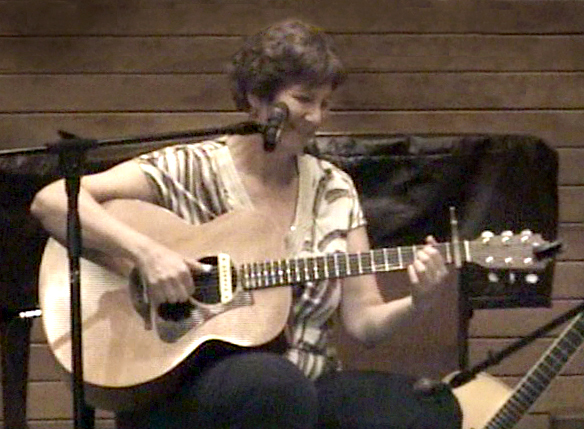 In addition to singing, I am forging onward to create new arrangements and instrumental versions for some of my older songs. Two weeks ago, I began working on a new arrangement with George that simply rocks! It is for one of my favorite songs, “Saying Goodbye.” This song will definitely benefit from my stronger voice. 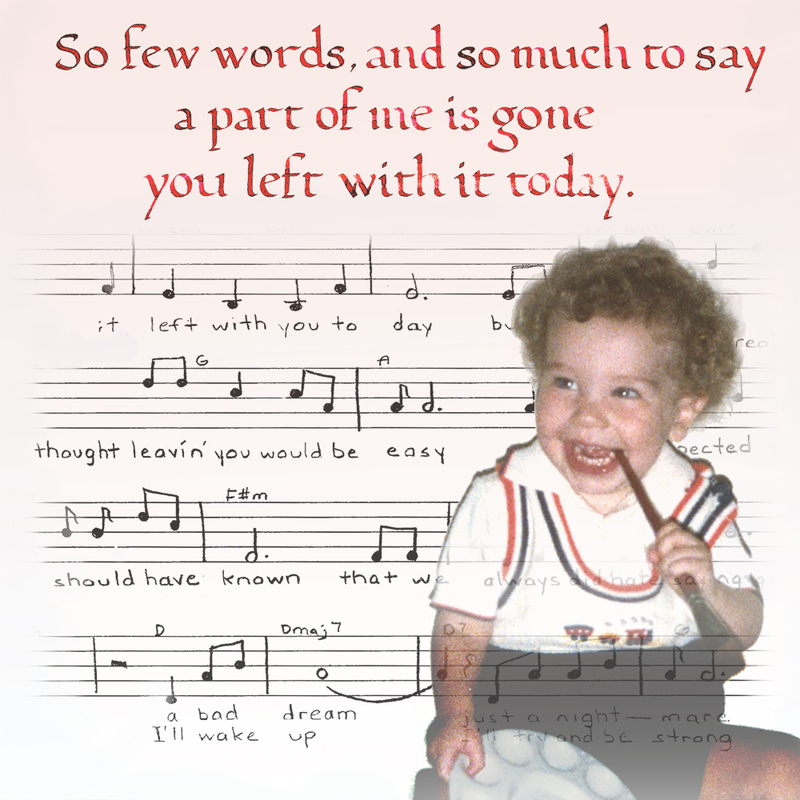 “Saying Goodbye” is applicable to many areas in my life, so it’s no surprise my song really moves me. My new arrangement is completely captivating. Even though it is not finished, it clearly has all the elements of a great song. Every time I hear it, I feel my heart racing with joy! 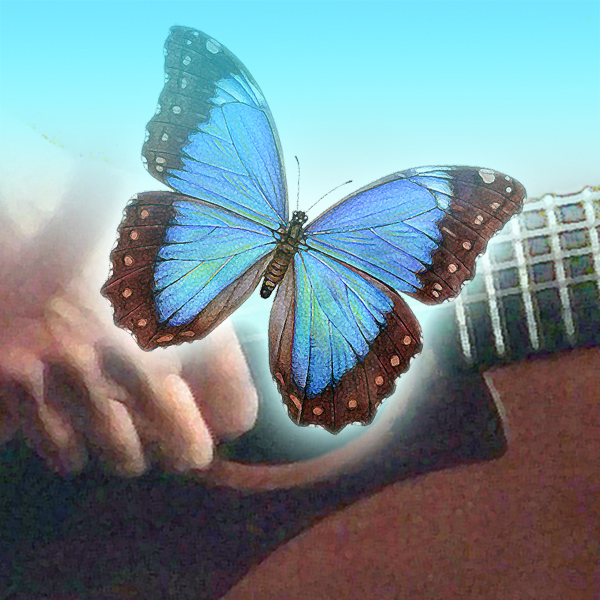 I often love to write about metaphors; my song lyrics and stories are filled with them. Therefore, it is no coincidence that I see beautiful metaphors that relate what I’m learning about singing to improving my life. And those same concepts that help me improve as a singer, even apply to my tennis game! Before I sing, the best result happens with intense stillness and focus. I must stop my breath before I start. This helps me to better manage my air. I remind myself to loosen my jaw. And most importantly, I strive for the inspirational feeling that allows my vocals to resonate within my larynx. All of those things must coincide and require tremendous concentration. Recently, I have found myself frenetically moving in many different directions. I believe that by constantly pushing myself, I am simply running away from my own feelings. I prefer not to stop and deal with painful emotions. I make more thoughtful decisions when I concentrate before moving forward. Music has inspired me to stop and listen. Singing is very intimate and there is great vulnerability with it. 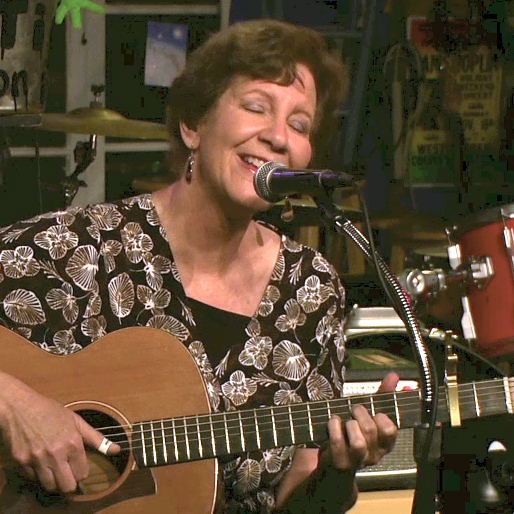 Fear, which is one of the greatest inhibitors in life, comes into play for me while singing. I am often afraid to open my eyes and even more so, lately, because they bother me. Closing my eyes definitely relates to my current life. I have been suffering greatly with accepting blurry vision in my left eye. But if I want to connect with my audience, I must force myself to keep my eyes open. Probably the most major singing problem I have is my fear of singing out. Somewhere along the way, I decided to sing softly in order to be safe. As a result, I have formed habits of using my throat muscles in an unnatural way. I’ve suppressed my natural voice. Pushing things down has resulted in unhealthy feelings and behaviors for me. Overeating is one example of this. Holding things in requires tremendous energy. It depletes me and diverts me from truly experiencing pleasure in life. I am striving to discover a more complete voice for myself and am learning to use my “red voice” (similar to my speaking voice), which strengthens my tone. But in order to do this, I must be willing to experiment. Sometimes, it sounds horrible and feels strange. If I don’t allow for this – with the trust that it will improve, I will remain stuck in my old habits. This is a perfect analogy about going through a divorce after 31 years of marriage. I uprooted my life, because I felt I deserved a chance to be happy. The adjustment is uncomfortable at times, but I have faith and confidence that things will improve. I have been a pacifist all of my life. I was always trying so hard to force my children to get along. I never expressed my true feelings in my marriage. My husband and I never had arguments or fights. When I told him I wanted a divorce, we never even discussed my reasons for it. Suppressing my emotions became a habit; I have a lot of fear about expressing anger. Emerging from my divorce represents a new pathway. I am eager to find my stronger voice to express my true feelings again! 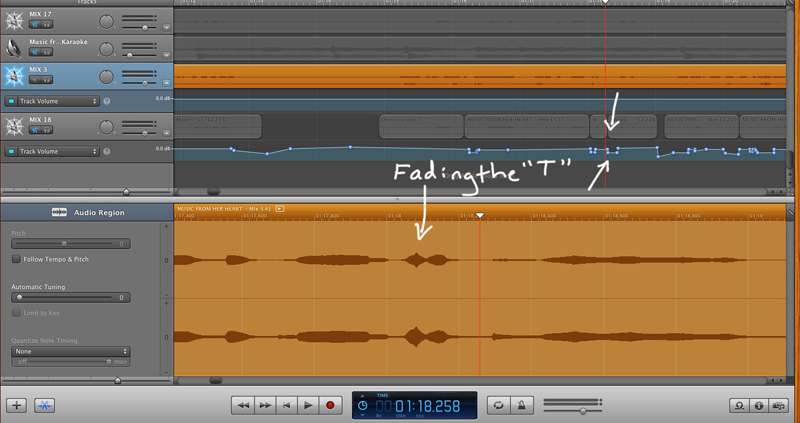 I taught myself Garage Band, and am adept at reducing harsh consonants and sibilance (S sounds) by using fades. An audio story contains hundreds of fades. Slowly, I am learning to work with the Pro-tools program; sometimes it has been overwhelming for me to take in so much. 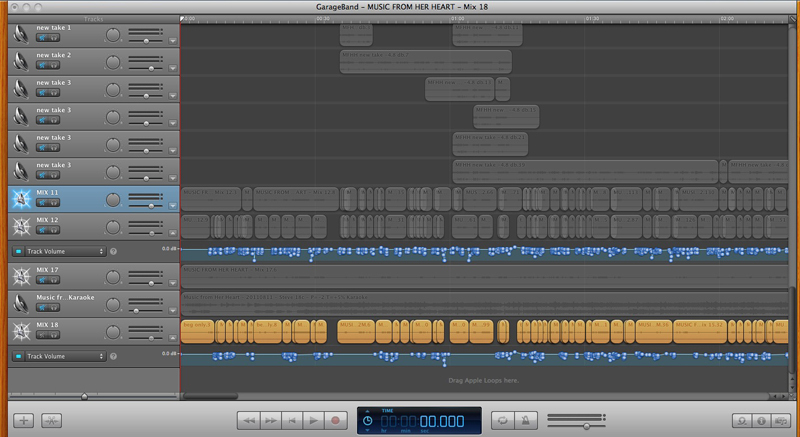 Below is an image that shows my work on Garage Band. The countless hours of teaching myself editing techniques has enabled me to create vocals I am proud of. I choose the best parts from many vocal takes in order to achieve this. Now I am faced with deciding whether to re-record some of my song vocals with my improved voice. This is a dilemma. I far prefer to move forward and record vocals for my newer songs instead. I want to reach out and start helping people with my music and stories even if my recordings are not my absolute best. In addition to drawing mazes while bored in high school, sometimes I created elaborate patterns. My father saved this old drawing of mine. My passion about singing and music is best shared with recordings from some of my recent lessons. 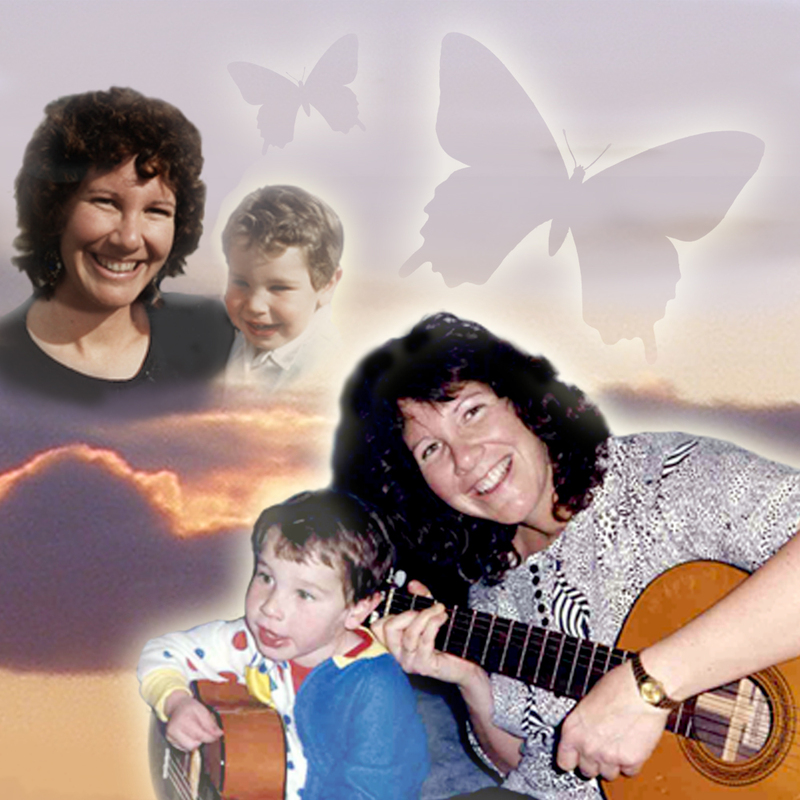 Because people are often too busy to listen, I’ve transcribed parts of these recordings. I am highlighting the words, which mention important concepts that truly are wonderful metaphors in my life. I got to sing this week! There was one glorious evening when my daughter went out and my son was gone, too. I sang for two hours. And what happened was my red voice started to come out; it was in all of my songs. I was celebrating it and loving it! I did a recording a few days ago. I found I had some red voice, but pulled back. What I didn’t like was when I got to the chorus; I wanted to go a little stronger. But when I heard the red voice– I pulled back – it had a funny tone, wavering. I have a waver in my voice, because when it does get strong, I don’t allow it. I’m afraid to hurt the microphone. I can play you my recording, so you can hear exactly what I’m talking about. Your jaw is still very involved – and look, I’m going to show you where your tongue is. It’s pulled back, which means it’s pressing down on your larynx. That causes your jaw to become involved. Also, there are so many things that happen when you compress all of the vowels. It’s so hard to remember to change it! You need to have this canister in here. The pharynx has to be blown up like a sail. Otherwise, the larynx pops up – it’s all compressed and there’s no resonance – so it sounds thin. You sing with a breathy voice, its lovely. You sing like that to your baby. But I agree with you, it doesn’t allow me to fully express how I feel if I sing only one way. But I think that you’re singing it to your baby. This is an important thing to notice about why you’re singing the way you’re singing. Sweetness and innocence . . . like you said to “a baby,” I’m a “lullaby singer.” Perhaps it’s because I’m healing myself and I’m trying to heal other people. Here, I’ll show you the part that stuck out for me. The words are, “You’re my lovely light, just not in sight.” This was very important for me to express. For people grieving, they can’t cope with the loss. But even if you can’t see it, it doesn’t mean it’s not there! Whenever it gets loud. These words have a problem: “Gone . . . Day . . . anything that’s big where I want to express it. Exactly! I sing the word “Day,” then I feel a waver and I’m tightening it up. At the end of the chorus, I totally pulled back. I really want to be able to keep going with that strength. This is a stronger song. You have to do it, Judy. No matter who you are, if you’ve never used that voice – it’s not going to be this beauteous thing. You’ve got to use it before you can train it. We always sing from stoppage. You can’t have breath management if you don’t ever stop the breath. That’s a very big concept. Yeah, I was practicing that. And it’s so interesting, I’m trying so hard to round the vowels – it’s multi-tasking. I think of one thing and I can’t do the other at the same time. So I can do one or the other, but I’m going to really manage the air on this one. Believe me, I’m just going to keep nagging you, so don’t worry. You can nag me for the rest of my life. Trust me, you’re going to be in my head. You don’t know. I hear your voice all the time! I hope it’s a nice voice. It’s very nice. It’s all about what I want to do to improve. There’s motivation here. The main thing for me is I like to articulate. And I think there’s a reason for it. For years when I’ve listened to music, I don’t know what they’re saying. And people have totally have told me that they love my articulation because they understand me. So it’s just reinforced that. And I appreciate what you’re teaching me. The problem is that just like another language, my mouth is going there. You’re so habituated to over-pronouncing. I have to say I think there’s an enormous amount of power in your voice that you’re trying to suppress in a funny way. Yes! You heard my voice on that old cassette. In my youth, I didn’t worry about it – I blasted! There’s a lot of energy there. I think it would be a good exercise for you to just let it fly. In recordings, it’s always sounded horrible if I did that. Do it at home. You don’t have trust yet in that voice. You’re over trying. Don’t even worry about it. At least I can find it! I just remember that whenever I went to a low note with the blue voice I couldn’t rely on it and I’d have the air push it through. So now when I use the red voice, it’s so much easier. It’s like speaking. Thank god, I’m finding this just in time. Now hold that position – hold that speaking idea. We’re not talking, we’re speaking. Over time you will learn how to sing in that voice. See, I’m singing in that voice, but I’m doing it with a light touch. It’s the register; it’s the way that I let my chords come together. A lot of times, there are muscles that we engage in order not to feel . . . I was just thinking of that! With the blue voice, I was thinking of Julie Andrews and the problems she had . . . trying to keep the breath going and soften things that naturally want to come out by holding it in. And she also did over-pronouncing. Oh, she did that, too? Okay, so she was controlling all this stuff with these big, giant muscles out here. And she ended up having some pretty major problems. Later on: (Demonstrating an exercise) I practiced! (Smiling with pleasure) You sure did. I did. I’m a good student. Ahhh, honey, I’m so happy for you. I’m overwhelmed. Really, thank you. I am, too. Why not? It paid off! It’s a beautiful thing when you do that for yourself. I deserve this. I have so many songs that I love! 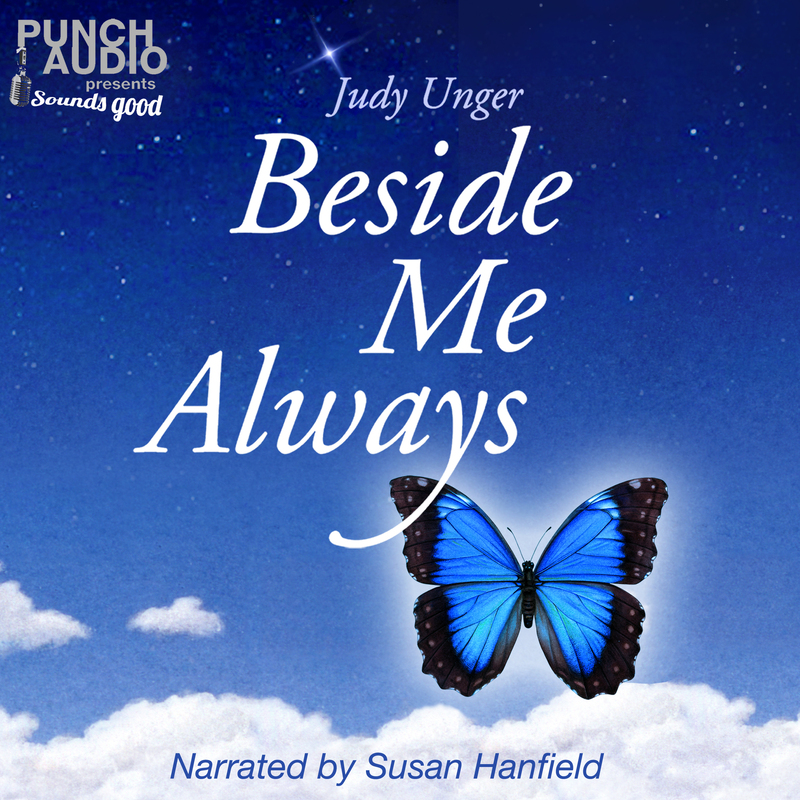 © Judy Unger and http://www.myjourneysinsight.com. 2013. Unauthorized use and/or duplication of this material without express and written permission from this blog’s author and/or owner is strictly prohibited. Excerpts and links may be used, provided that full and clear credit is given to Judy Unger with appropriate and specific direction to the original content. This entry was posted in Uncategorized and tagged composing, creativity, Friendship, Garage Band, gray divorce, grief, GRIEF RELATED, guitar, hopefulness, inspiration, Kimberly Haynes, loss, lovesong, lyric development, metaphors, metaphors about singing, Music, music editing, musical inspiration, musical passion, navigating divorce after a long marriage, opening up, original songs, performing, red voice and blue voice, saying goodbye, singing, singing openly, singing techniques, song arrangements, songwriting, vocal coaching, vocalizing, voice lessons, voice teacher. Bookmark the permalink.